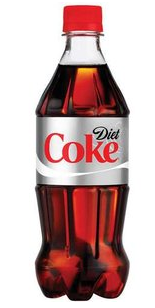 Confession time: Despite my efforts toward good eating and healthy habits, I've been carrying a one-Diet Coke-a-day habit for a while. I would buy the stuff knowing it was (1) a waste of money (2) bad for me and (3) a resource hog to bottle and ship it. I thought it was my little afternoon pick-me-up, something I "deserved". I'd been thinking about giving it up for a while, but didn't. Then I returned from Boston and stopped taking it to work and avoided it at home. I haven't had one since and haven't missed it either. Research suggests that the artificial sweeteners actually cause you to crave more sweets and I truly think that is valid in my case. My late afternoon sweet tooth has indeed abated. My Diet Coke days are over. I just drink water and when I want a change-up I have a LaCroix sparking water (and the occasional beer or wine ;-) My favorite LaCroix (not pictured) is coconut yummmmm. I rarely get on the scale -- maybe every two months -- but for most of the year I'd been holding steady about 5 lbs up from the number I thought was an optimum race weight. I figured maybe that lower number wasn't all that reasonable. But a quick check-in the other day (and the day after to verify) showed I was squarely, and happily, at race weight. Shocker! I think it happened because frankly, I've eaten less. As with the Coke thing, there was no decision-making moment, it was more of just a vague effort to avoid extra snacking and let myself get hungry before eating again. Cutting out the Diet Coke and having my appetite stabilize helped. Having the stress of the injury lift, feeling happier, and staying busy all contribute too. Now to just maintain!! Although things are better on the nutrition front, my sleep patterns are a bit of a mess lately. I've had about 10 days of rough sleep, waking up around 3:30 am then slipping into some otherworldly coma till 5 or so. I'm blaming it on high pollen and age and loading up on melatonin till it passes.